HDMI 2.0 na 4K/Ultra HD 12G-SDI konvertor. Převod HDMI na 2x 12G-SDI 4K/UltraHD/2K/HD. 8 HDMI kanálů zvuku nebo 2 kanály analogového audia mohou být embedovány do výstupního SDI (popř. Fiber) signálu. Včetně 2x Fiber (až 10km) vysílače (Single Mode LC Fiber Tx SFP). 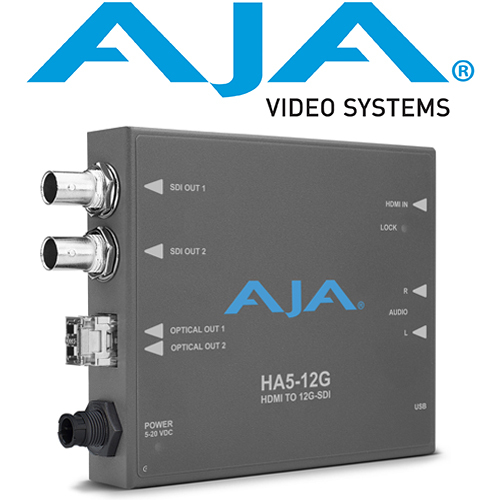 AJA’s HA5-12G allows users to convert an HDMI 2.0 input to two 12G-SDI single link outputs. It includes two SDI DA outputs and transmits 12G-SDI on each SDI link, reducing cable runs when transporting 4K/UltraHD SDI. 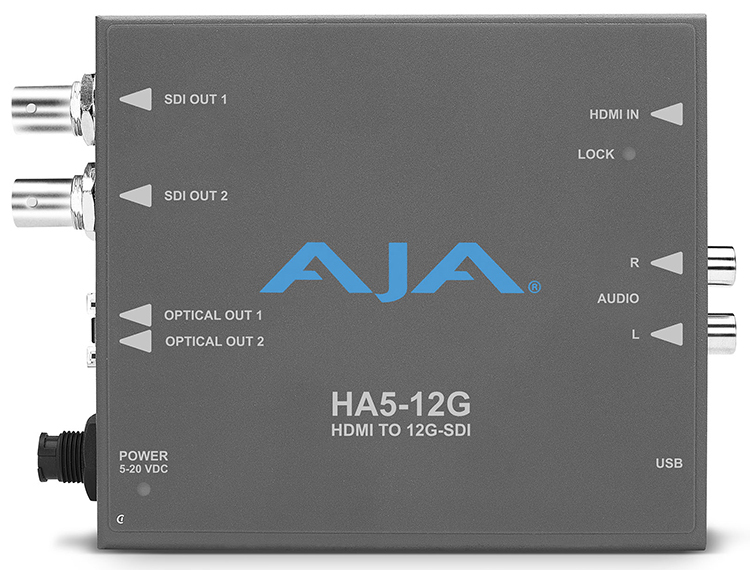 HA5-12G supports up to 8-Channels of audio from the HDMI source or 2-Channel analog audio (RCA), with eight or two channels of digital embedded audio on 12G-SDI. Fiber SFP equipped HA5-12G models are available (please see separate listings), including the HA5-12G-T single channel transmitter, which extends HDMI source 4K signals over long distances (10 km Single Mode). The HA5-12G-2T dual channel transmitter offers two 12G-SDI coaxial outputs and two 12G-SDI over Fiber outputs to simultaneously enable HDMI 4K source extension to multiple locations without a distribution amplifier. HA5-12G provides this support for your 4K/UltraHD/HD HDR pipelines to HDMI compatible displays by generating HDR metadata in accordance with HDMI v2.0b/CTA-861-G. HA5-12G also provides support for Hybrid Log Gamma (HLG) HDR displays over HDMI. Typical 4K signals use a resolution of 4096 x 2160 pixels while UltraHD signals measure 3840 x 2160. This difference can prevent some monitors from being used either in full 4K workflows or in UltraHD workflows. HA5-12G can compensate for these resolution differences, allowing UltraHD monitors to be used in 4K productions and vice versa. HA5-12G also supports High Frame Rate (HFR) inputs. 4K/UltraHD signals at 50 or 60 fps can be fed into HA5-12G and output at up to 60p for viewing with appropriate HDMI 2.0 capable displays. The 12G-SDI input on HA5-12G allows extremely high quality signal representation through to the HDMI output for use with large raster and deep color workflows where image quality is critical. HA5-12G accepts progressive standard definition signals at 525p and 625p for compatibility with DSLR cameras, allowing the signal from those cameras to be easily incorporated into SDI workflows.